This is a little late but remember when I told you I've been busy?! 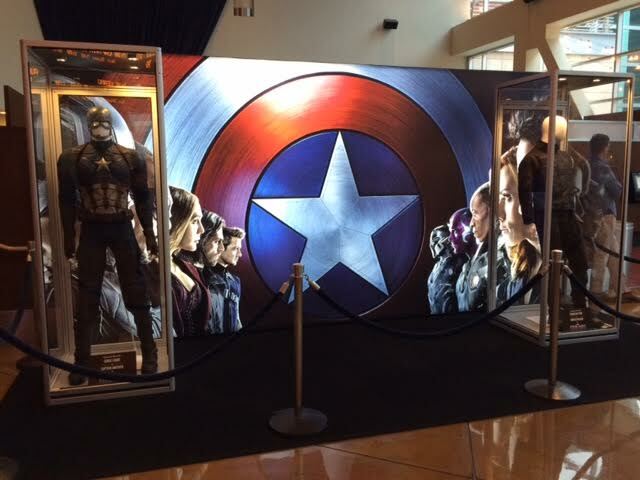 Of course we kicked off the summer cinema season with a Thursday, May 4th screening of Captain America: Civil War at The Arclight Hollywood in laser 3D. We followed it up with a 2D screening at The Chinese Theatre's luxurious but still not real sized IMAX that Saturday. My original consensus was that Civil War was a terrific Marvel film with excellent action, lots of characters, cameos and funny bits. But it wasn't a terrific Captain America film as it's diluted by the inclusion of Iron Man and needing to introduce Black Panther and Spider-Man to the Marvel Cinematic Universe. Plus it's misnamed as there's more Avengers in this Captain America film than there were in the actual Avengers movies. 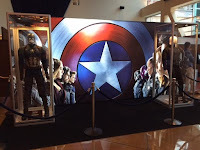 As a Captain America fan, I've long been annoyed by Cap's use as the MCU placeholder. First Avenger was an excellent, rock'em, sock'em throwback with it's World War II setting and sci-fi tinged sensibility that set up The Avengers. While The Winter Soldier was more or less the SHIELD movie as it ended the arc of the secret organization. 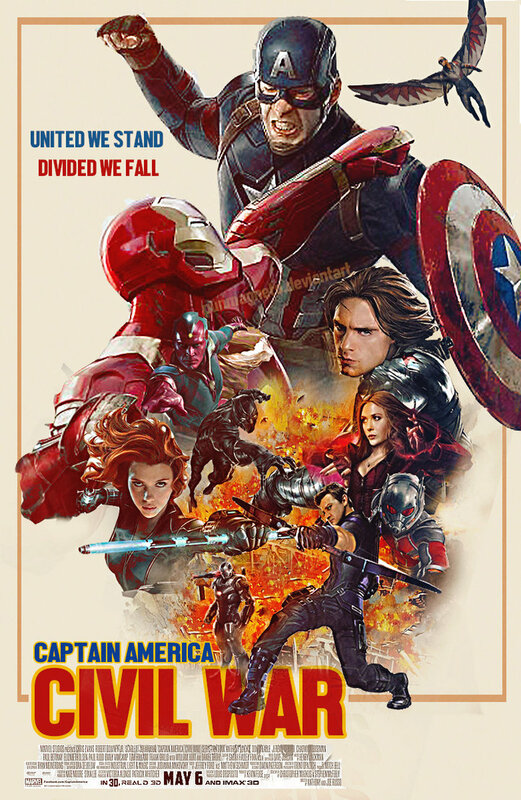 Then Civil War caps off The Avengers phase by breaking them up while launching two other franchises. Meanwhile, Thor and Iron Man have gotten their own movies without having to keep viewers informed of what's happening in all things Marvel land. Upon second viewing I did appreciate the Captain America dynamic a bit more as the material with Cap, Falcon and Bucky is all solid, Cap gets to stand tall for what he believes and smooches his lovely former neighbor Sharon. You can forgive the Marvel-ness of the affair, the Giant-Man cameo was awesome, I still just wish they'd believe in Cap and give him a standalone movie. It was a little weird that Cap has now become Superman, being able to survive any fall or beating, can stop a helicopter from taking off and take punches from Spider-Man. Pretty impressive for a guy who's basically supposed to be an Olympian who doesn't get tired. But with all this interconnected blah blah blah for better or for worse, that's just not going to happen. Can you imagine if Zemo was actually Baron Zemo with ties to Cap from WWII? Instead of having a flashback sequence with Bucky performing a hit, it could have set up Cap and Zemo's feud from the 40's then cut to today, they're both back. Whether it's the original Zemo or his kid like in the comics. 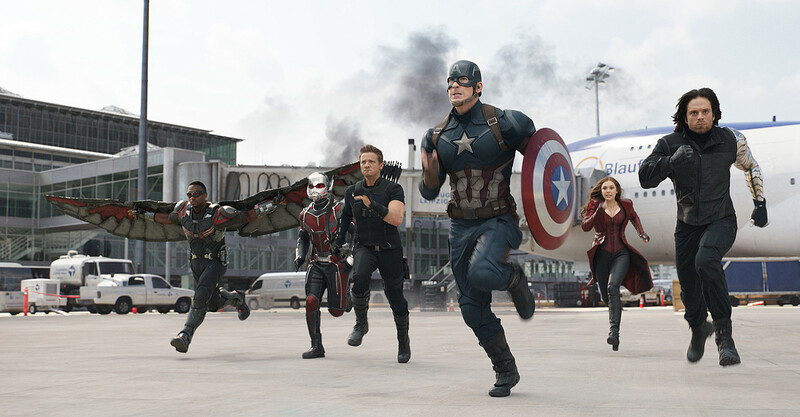 You then have Falcon and Cap looking for Bucky and the three teaming up to try and stop and eventually face off with Zemo's sleeping super soldiers. Could be a fantastic Captain America movie that's two hours instead of a pseudo Avengers flick that runs two and a half and is 40% Tony Stark/Iron Man. With each Marvel star's long term contracts coming to an end, I wonder if Chris Evans will reenlist or take a break. He doesn't seem to be starving for work, given that he's only done what, Snowpiercer and directorial effort Before We Go in between Marvel films. Always in shape but if you notice, Evans is shirtless in part I, in a tank top in II and dons a tight tee shirt in III so maybe he's getting tired of the workout routine as well. While Chris Hemsworth has fallen flat as a leading man in Rush, Blackhat, In the Heart of the Sea, The Huntsman and definitely needs his Thor alter ego to keep his career going. As well as appear shirtless in about every film appearance and may be on his way to Zac Efron territory who can't find work without working out. It's no secret that Robert Downey, Jr. has made a mint from Marvel and has stated more than once that Iron Man 4 is not a priority. But a Tony Stark cameo in the rebooted Spider-Man is rumored while Civil War sets Cap up to appear in Black Panther while they could both return for the two part Avengers: Infinity War so we'll just have to wait and see.